Unfortunately, there are times when even the best of us artists perform a bit lazily. The Secret World of Arrietty, the first Studio Ghibli film to be directed by Hiromasa Yonebayashi, is certainly an attractive-looking film, and I can't deny that I was pleased with many of its small achievements. And yet, we deal with Studio Ghibli here, the animation company that has perhaps spoiled us anime reviewers more than any other, and as beautifully animated and drawn as their movies have been, they have also simultaneously managed to delight with some morally complex and continuously fascinating story such as that seen in Princess Mononoke, the sights of the animators' ever beautiful trees, flowers, and wild animals complemented by the directors' remarkable storytelling ability. In The Secret World of Arriety, that narrative strength is largely absent, with the film lying uncomfortably between plotless meandering and overwrought drama, a likable cast of characters never being given the space to develop proper relationships with one another, and several illogical developments managing to make the film's heavier elements more amusing and melodramatic than affecting. Arrietty is enjoyable to watch and enticing to look at, and yet the magic is simply not there, the entirety never quite gelling together and ultimately being somewhat unsatisfying. 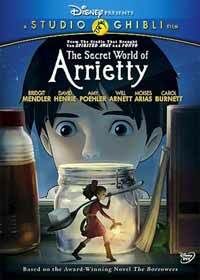 What is most disappointing about The Secret World of Arrietty is that the characters, by and large, give the film a great deal of its joy, and it is thus a shame that the film fails to fully make use of them. Sho (renamed "Shawn" in the English version), Arrietty, and her parents are what you'd expect to see from Ghibli's hands, the sort of people you wouldn't mind having over for tea and who might make life a little more pleasant if you happened to run into them while walking, and Arrietty herself is basically a lovable hellion in miniature, dangerously wandering through the back gardens of Sho's house and taking delight in converting clothespin into rapier and engaging in the first "borrowing" of her life. Really, I must admit that there were many moments that amused me, such as Arrietty's various escapades with the house's cat and her scenes with her easily-flustered parents. Yet ninety minutes is hardly enough time to flesh out the original story's characters, and having seen the BBC's miniseries adaptation, I may have to argue that the tale is best suited to a short serial rather than a single theatrical release, which fails to give the setting time to unfold and forces us to accept the characters and their condition on a little too much blind faith. We progress all too quickly from a comfortable if precarious life in the Borrowers' subterranean home to a point at which the characters fear for their lives and prepare to move out, the plot progression feeling crammed and the attempt to introduce a "theme", some well-trod tale of fighting rather than rolling over for fate, coming across as melodramatic. Unfortunately, the English voice acting does not do the story justice either, for although several people turn in fine performances, the overall feeling is stiff and uncomfortable, with the dialogue between Sho and Arrietty losing its impact in awkwardness and her father's Harrison Ford-esque growl getting older even faster than the aging actor (I've yet to see the Japanese version). The entire effect is that of watching a play in which the actors from one's previous favorite productions arrive to put on a new piece and fail to develop any chemistry, and while there is joy within observing such an effort, the ultimate feeling is one of let-down. And indeed, at film's end, the story has by-and-large failed to move, scattered successes such as the climax's effective tension and certain tender moments being forgotten within the general feeling of malaise. The Secret World of Arrietty is hardly a bad film, but it feels lazy for a Ghibli production, with a long-extant story being given none of the revitalization that, say, The Little Mermaid was given in Hayao Miyazaki's Ponyo. Relying on the original story verbatim undermines the movie due to its short running time, and what tension there is comes from such follies as making a perfectly pleasant and likable character (Sho's housekeeper) behave in an uncharacteristically and illogically mean-spirited manner. As said, Ghibli has spoiled me with its stories, and I've seen enough triumphs that I simply can't accept a plot twist based on a cheap gimmick such as that, one that says "the audience will be made of children and thus will not notice" so much. I'm simply used to the studio trying harder: I want more than the merely pretty pictures of the garden and the house and desire the magnificence of Ponyo's prehistoric fish, My Neighbor Totoro's furry gods, the flying sequences in Castle in the Sky, or even the city vistas of Whisper of the Heart (whose character Seiji, in fact, bears an eery and possibly not-so-coincidental resemble to Sho). The Secret World of Arrietty, sadly, feels just like a movie made for children in the sense that the slightly slackened effort to stand out can be swept under in the hope that the young audience will observe nothing, and the degree to which the studio's other films have avoided this makes me feel slightly cheated. I'd like to always be able to say that no Studio Ghibli film is a waste of time, and in spite of my complaints about this film, my statement remains intact. Arrietty has charm, it has a likable cast, and it has the studio's talented assortment of artists on its side, making it a film that has enough successes to carry one through it. But in an age where mediocrity is becoming as much of an evil as actual failure, Yonebayashi's first directorial work just isn't going to make the cut. Such a film cannot survive on scattered charm alone, and when it completes, its failure to move the viewer's core will quickly be filled in by some other work, a mistake that not even the work of Japan's best studio can afford. Recommended Audience: The worst that happens is that a cat chases after the grasshopper-sized Arrietty and that other scattered and non-fatal moments of peril occur. If you're the kind of parent who won't let their child in to see that, I'd suggest that you rethink your degree of protectiveness.